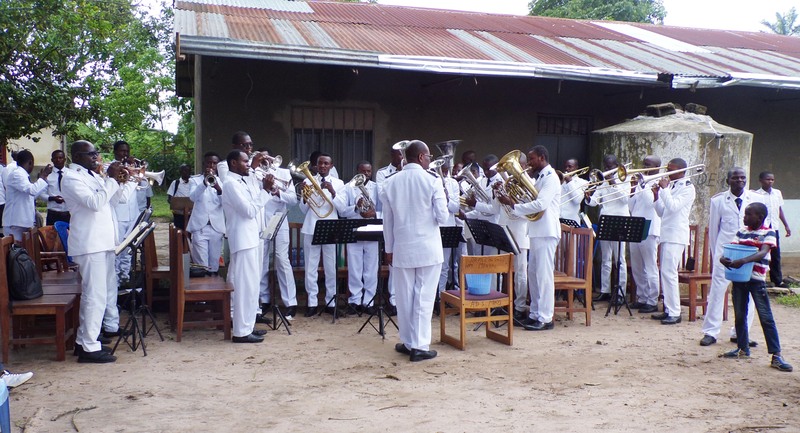 On Sunday, 28 October 2018, the Kintambo Band (Bandmaster Henri Makanda Nkodia) had the privilege of being on duty at the Menkao Post in the Plateau District (the eastern part of the city of Kinshasa) for the district’s tenth anniversary Thanksgiving service. District Officer Major Norbert Nkanu, after the presentation of the various guests, spoke about the history of the district, presenting the district and its challenges. The Menkao Central Choir was consecrated and sponsored by the N’diili 2 Post Choir (East Kinshasa Division). Major Adolphe Masidiyaku, Divisional Secretary for East Kinshasa and the post officer of N’diili 2, exorted the assembly to stad firm with God, pray, and work. This article was posted in News and tagged Adolphe Masidiyaku, anniversary, Henri Makanda Nkodia, Kinshasa, Kintambo Band, Menkao Central Choir, Menkao Post, N'diili 2 Post Choir, Norbert Nkanu, Plateau District, special event on 1 December 2018 .